Speedy GrowTM is made with the world's fastest growing, fresh organic kelp seaweed, Ecklonia maxima. Its all natural, environmentally safe formula is perfect for both your outdoor and indoor plants. The improved drought and flood tolerance makes it long lasting and economical, too. 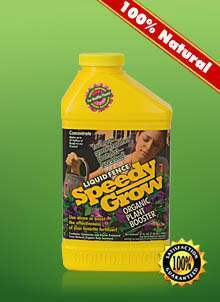 We're so sure you'll be completely satisfied with Speedy Grow Plant Growth Accelerator, we back it up with a written 100% money-back guarantee. Auxins are naturally produced in the top growth of plants and travel down to the roots. Cytokinins are naturally produced in the roots of plants and travel up to the leaves. These two plant hormones work together triggering either growth of new leaves and shoots, or new roots. If you take a cutting from a plant, and place it in water, the plant tips continue to produce auxins that travel down the plant to the base of the cutting. Since there are no longer roots present, an imbalance between auxins and cytokinins develops. The plant adjusts for the excess auxins by developing new roots. These roots then produce additional cytokinins, which then trigger increased top growth. Speedy Grow copies nature, it triggers this same effect by delivering an abundance of auxins to the root system. These auxins then trigger the natural response of increased root production followed by tremendous top growth. The increased root mass has the added benefit of increasing drought and flood tolerance, and producing much healthier plants. Will it burn my plants? No, because it's not a traditional fertilizer, it will not burn plants and can actually be used along with both chemical and natural fertilizers. Fully tested - Member tested and recommended by the National Home Gardening Club!